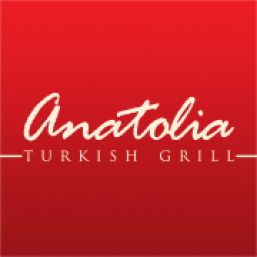 Anatolia Turkish Grill is currently closed for delivery and it will open at . Oriental cold appetizer made with chick peas, tahina and garlic. You Can’t go wrong with this! An all time-favourite thick dip made of thaina, lemon and a hint of yogurt andolive oil. A special dip made with onions, garlic, spices, walnut and roasted peppers. A very refreshing start for your meal. Our minced meat pie made with special dough, topped with extra lean ground beef seasoned and mixed daily for your indulgence. Sampler tray of all our cold appetizers with your choice of one of Yesil Salata or Coban Salatasi. Served in a traditional outfit. For a nice, long get-together! Our cheese pie made with special dough, topped with our own mix of melting cheese. Something you rarely find elsewhere. Baby pies with cheese, mushroom, tomatoes, and tender slices of mear. Served in multiples of 2 to double your satisfaction. Creamy tomato soup that is anything but classic. The traditional green salad with cucumber, iceberg lettuce, carrot, red cabbage, tomato andsweet corn. A simple Turkish approach to salad made of cucumber, tomato, onions, and sweet chilipeppers. A different salad experience - comes with tomato, onions, walnut, and balsamic vinegar. Tender doner kebap in a special home baked bread bun with lettuce and tomato. It's theauthentic Turkish way of eating Shawarma. Served With Our Famous Old Fashioned Fries, Pickles, And Salad Vegetables. Juicy chicken döner slices in a special home baked bread bun with lettuce and tomato. Served With Our Famous Old Fashioned Fries, Pickles, And Salad Vegetables. Delicious fingers of kofte in a special home baked bread bun with tomato and onions. A perfect choice when you are half-hungry. Served With Our Famous Old Fashioned Fries, Pickles, And Salad Vegetables. Our new grilled Tavuk Kofte in a special home baked bread bun with tomatoes and onions. Served With Our Famous Old Fashioned Fries, Pickles, And Salad Vegetables. Our tender doner meat in soft home made flat bread wrap with lettuce and tomatoes. This is ahit nowadays in Turkey. Served With Our Famous Old Fashioned Fries, Pickles, And Salad Vegetables. Juicy chicken doner with a special flavor in soft home made flat bread wrap with lettuce andtomatoes. Served With Our Famous Old Fashioned Fries, Pickles, And Salad Vegetables. Grilled lamb chunks in soft home made flat bread wrap with lettuce, onions andtomatoes. Great meal anytime of the day. Served With Our Famous Old Fashioned Fries, Pickles, And Salad Vegetables. Juicy chunks of chicken in soft home made flat bread wrap with lettuce, onions andtomatoes. Suggestion: try it with our garlic sauce. Served With Our Famous Old Fashioned Fries, Pickles, And Salad Vegetables. A skewer of Adana Kebap in soft home made flat bread wrap with lettuce and tomatoes. Served With Our Famous Old Fashioned Fries, Pickles, And Salad Vegetables. Lean beef tenderloin sliced to very small cubes and stir fried in a special pan with a special seasoningrecipe,Wrapped in softhomemadeflat bread with onions. Chili lovers will love this one. Served With Our Famous Old Fashioned Fries, Pickles, And Salad Vegetables. Secret blend of beef & lamb meat in tender & thin slices over a special bed of thick pitabread soaked with home-made fresh tomato sauce and served with fresh yogurt. Heard alot about it? Now you’re about to try it. If you’re not a fond of saucy food, our tender & thin slices of doner meat are served with ourfamous old fashioned fries and salad vegetables. Juicy chicken shawarma with special flavor served with our famous old fashioned fries andsalad vegetables. To boost flavor, we added garlic to our kofte. The meal is served with grilled tomato and green chili pepper, salad vegetables, our famous old fashioned fries and bulgur rice. An extremely long skewer of fresh lamb minced with diced onions, tomato and hot chili servedwith grilled tomato and green chili pepper, salad vegetables, our famous old fashioned fries andbulgur rice. It's given this name because the art of making kofte started in the Sultan Ahmet district in Istanbul. Fresh beef minced in special seasoning served with grilled tomato and green chili pepper, saladvegetables, our famous old fashioned fries and bulgur rice. Our special kofte stuffed with a rich portion of melting cheese and served with grilled tomatoand green chili pepper, salad vegetables, our famous old fashioned fries and bulgur rice. Surprise your taste buds with a whole new experience of extra lean striploin beef rolled to acigar shape and stuffed with mushroom and melting cheese, served with grilled tomato and green chili pepper, salad vegetables, our famous old fashioned fries and bulgur rice. Be aware Of addiction. A chance to sample our best sellers with a dish containing Adana Kebap, Tavuk Izgara, Fistikli Kebap and Prizola and of course served with salad vegetables, our famous old fashioned fries and bulgur rice. Steak done in pure Turkish style. Comes to you in four slices of tender striploin beef servedwith grilled tomato and green chili pepper, salad vegetables, our famous old fashionedfries and bulgur rice. Four slices of tender chicken breast with special marination served with grilled tomatoand green chili pepper, salad vegetables, our famous old fashioned fries and bulgurrice. Fresh and tender lamb chops with special seasoning grilled to perfection and served with grilled tomato and grilled chili pepper, our famous old fashioned fries and bulgur rice. A very very special dish made with fresh minced lamb seasoned with an amazing combination of spices and pistachio served with grilled tomato and green chili pepper, salad vegetables, our famous old fashioned fries and bulgur rice. Fresh chunks of tender veal with special seasoning served with grilled tomato and green chili pepper, salad vegetables, our famous old fashioned fries and bulgur rice. Chunks of fresh chicken breast with special seasoning served with grilled tomato and green chili pepper, salad vegetables, our famous old fashioned fries and bulgur rice. A different taste of kofte made with minced chicken with parsley and a blend of special spices,herbs and garlic char- grilled and served with salad vegetables, our famous old fashioned fries and bulgur rice. A mix of wings and drumsticks of baby chicken with special spicy marination char-grilled and served with salad vegetables, our famous old fashioned fries and bulgur rice. A fabulous mix of rice, chicken and spices wrapped beneath a special blanket of dough. Ask your waiter to tell you the story behind referring to this as “Wedding Rice” in Turkey! The Turkish version of Kibbe with double the meat, half the fat! Fresh, crunchy, and irresistible way to conclude your meal. Made with shredded pastryand a rich portion of cheese and prepared to order. An indulging portion of fresh Turkish milk cream can be added to your kunefe for extrasatisfaction. From the authentic Ottoman cuisine. Dried figs stuffed with cream and topped with specialsweet syrup. Double layer of shredded filo pastry with a delicious filling of pistachio, prepared daily.